When the great war between the Redwoods and the Centrals occurred three decades ago, the Talon Pack risked their lives for the side of good. After tragedy struck, Gideon Brentwood became the Alpha of the Talons. But the Pack’s stability is threatened, and he’s forced to take mate—only the one fate puts in his path is the woman he shouldn’t want. As the worlds Brie and Gideon have always known begin to shift, they must face their challenges together in order to help their Pack and seal their bond. But when the Pack is threatened from the inside, Gideon doesn’t know who he can trust and Brie’s life is could be forfeit in the crossfire. It will take the strength of an Alpha and the courage of his mate to realize where true loyalties lie. Gideon Brentwood, the Alpha of the Talon pack never expected his fated mate to be a submissive, let alone be one from another pack. Brie Jamerson, daughter of Willow and Jasper of the Redwood Pack knew who her fated mate was since she was seventeen years old. 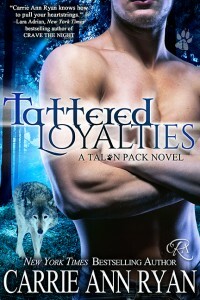 She never acted on it because, one she is a submissive wolf and two, he is an Alpha of the Talon Pack. It was her belief that Alphas’ and Submissives’ never mated. It was unheard of. So besides her best friend/cousin Charlotte, no one knew until years later when her family went to the Talon territory to discuss business. Suspense, ✔. Drama, ✔. Passion, ✔. Envy, ✔. An evil plot to rule the world, ✔. All and all Carrie Ann Ryan delivers. I don’t know how she can knock out hits like she does, but please if it involves keeping us with the Redwoods and now the Talons; keep them coming. I really enjoyed that we were able to grow with Gideon and Brie on their becoming one within their relationship. But most importantly, I enjoyed how Brie was able to develop a relationship with in her new pack whilst also growing in her abilities as an Alpha/Submissive. She definitely threw out the preconceived notions that the elders and even her cousin Finn threw in her face. The Brentwood’s are growing on me and I look forward to reading more about them, especially with what’s to come. The Protector’s Heart (Wilde Creek 3) Is Out Now!! The Protector’s Heart _12 Final copyHappy Saturday everyone! It’s sunny and cold here in New Jersey, but it’s a great day for The Protector’s Heart!! I’m thrilled to share the latest installment in the Wilde Creek series with you. Malachi and Nila were so much fun to write. I hope you come to love them (and her adorable son Jack) as much as I do! I wouldn’t be anywhere without a lot of help. From Word Vagabond for editing the story, my beta readers (Joyce, Jackie, & Shelley), the gorgeous cover by Romance Book Cover Designs, and the support of the Wild Shifter Babes Street Team. Thank you all from the bottom of my heart for your encouragement, expertise, and general awesomeness!!! Long before Mason left Willow Bend, Ryan met his mate and brought her home…this is the prequel to the Wolves of Willow Bend and the story of Ryan and Tiffany. Ryan Huston serves the pack in all their public financial dealings. Connected politically and personally, he possesses a unique ability to segue into and out of human life. He’s never been afraid to use his animal’s dominance to his advantage and, though he and Toman—the Alpha of Willow Bend—are often at odds, his loyalty to the pack has never truly been tested. Not until he meets Tiffany. Tiffany Anderson grew up hard in a world defined by its uncertainties. Meeting Giles Taglioni seemed like a happy accident turned fairy tale. Five years into the abusive marriage, Tiffany wants out. Tiffany knows Taglioni will never let go of his daughter—he’d kill her before he lets her take Alexis away from him. A desperate woman with no options until a chance encounter changes everything. Ryan is like no one Tiffany’s ever met, but she doesn’t dare believe him when he offers to help her. Long ago made familiar with the monsters in the dark, she doesn’t dream of princes on white horses sweeping her away. She also never imagined a big, bad wolf was exactly what she needed. As promised, I have read all five books of the series and I truly remained on the edge of my seat. After receiving my ARCs, I jumped into the world of Rosie, Kevin and Grey. JJ Jones took us on a paranormal mysterious journey involving Fairies, Witches and Shifters. Rosie, who through the use of her special abilities and her assistant/best friend Hope; has become one of the most sought out private investigators in Tampa, FL. Because of this she became involved in a special case after being approached by Kevin; a gorgeous, lion shifting Federal Agent who operates solely by the book. What Rosie didn’t expect was to have an attraction to this client. (Doesn’t this always happen? LOL 😁) Kevin’s partner went rogue and he needed help tracking him down before he hurt himself or someone else. Whatever the case maybe, they needed to do it sooner than later. Grey, also gorgeous, a wolf shifter gone rogue, ex-Federal Agent/Kevin’s partner and best friend is being controlled by an unknown source. These books, in succession keep you on the edge of your seat as you venture through the chases, captures, kidnapping, love triangle, fight scenes, love scenes and conclusion. Basically it is full of paranormal suspense, drama and love. Although I think the ending was kind of weak to my liking, I would suggest that you read this series.